The successor of the single channel transceiver SE-100 / FOX has been developed by Autophon. The portable transceivers SE-101 and SE-102 are very similar, they only have different frequency coverage. Both sets have 24 switchable crystal controlled frequency channels, the two common channels 45 and 46 allow communication between the two different sets. in the range 22,35 - 24,65 MHz (channels 23 - 46). 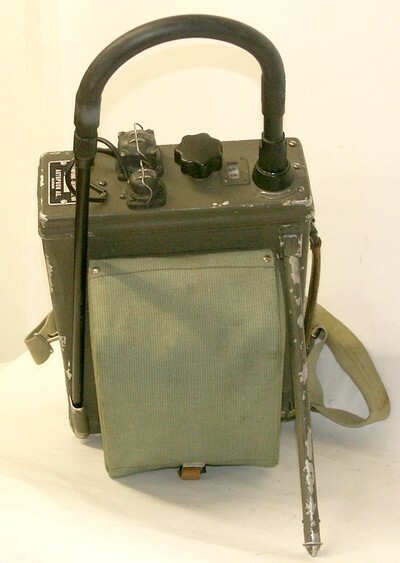 The wireless set SE-102 consists of a backpack transceiver with the dimensions of 321 x 234 x 87 mm and a weight of 8,3 kg; it is powered by three LT / heaters batteries (BA-37 resp. Nr. 10001; 1,5 V) and three b+/ HT batteries (BA-38 resp. Nr. 10103; 103,5 V). 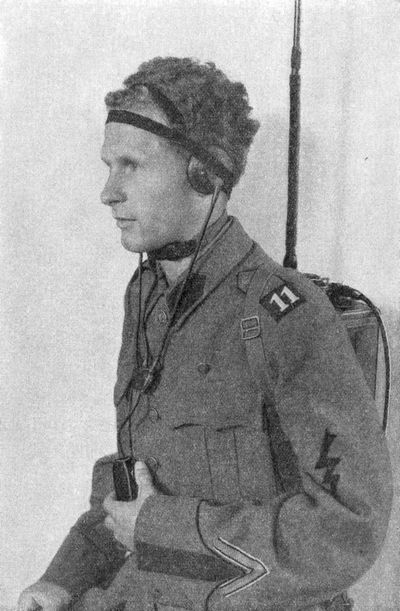 With the transceiver a monophon (combination of microphon / speaker with a push to talk button) or a combination of headphones and throat mikrophone for use in noisy surroundings can be used. With it's output power of 1,3 W, the standard range is 4 km within housing areas and up to 20 km from a well suited location on a hill top, it is similar to the range of a common CB set. The receiver is a single conversion circuit, the R.F. signal from the antenna has to pass two R.F. amplifier stages (5678 and 1T4) and is mixed with the signal of the crystal oscillator (1L6); the intermediate frequency of 1200 kHz is amplified in two stages (1T4, 1T4); after demodulation (1S5) and the	final audio amplifier stage (3S4) it is fed to the headphones. In transmitting mode, the audio signal coming from the microphone has two pass two amplifier stages (1S5, 3S4), mixed with the oscillator signal from V5 (1T4) and is used to modulate the R.F. carrier signal generated in the main oscillator (1T4), after the driver stage (3S4), the two R.F. finals (3B4) generate an output power of 1,3 Watts. 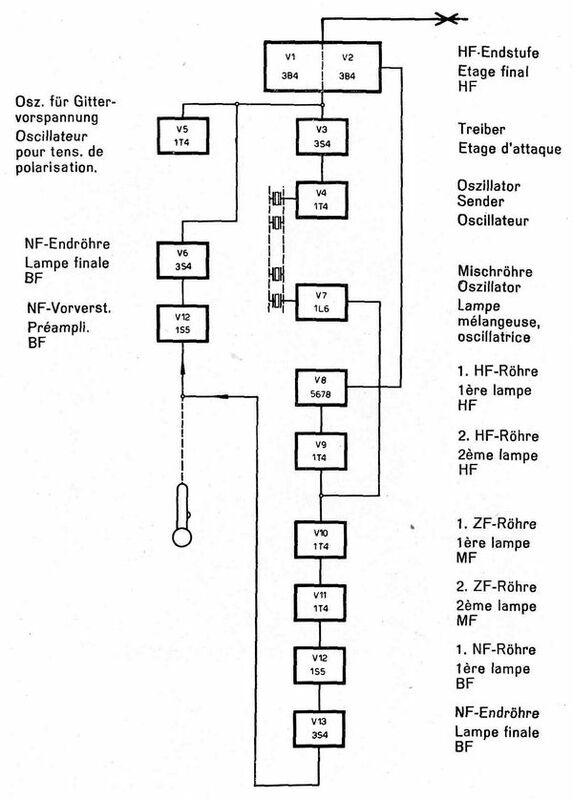 All frequencies are crystal controlled, the channel selector moves the switch of the "crystal drum", this arrangement of channel switching has been used for Autophon's higher powered sets SE-206 / SE-209, too. To use the set, insert three LT 7 heater batteries and three HT / anode batteries in the battery compartment at the bottom of the transceiver. As the power consumption of the HT batteries is varying, Autophon did recommend to swap batteries in a clockwise sense every six hours. The set can be powered alternatively from a hand cranked generator or a mains power supply, as far as I know, the external mains power supply constructed by Autophon has never been in use within the Swiss Army. 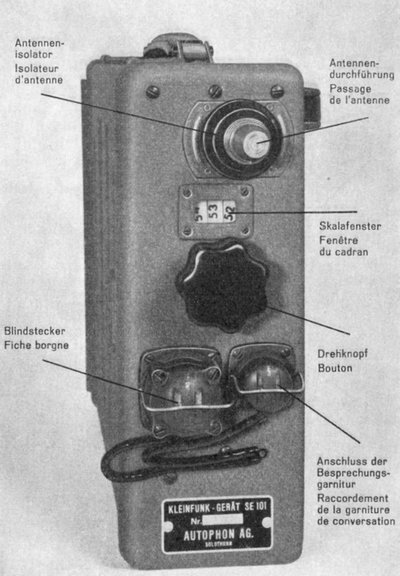 The circular switch at the monophone is used to switch on the set, it has three steps 0 (off) - * (low) - ** (high volume). Use the channel selector to tune the set to the desired channel, pull out the antenna and press the push-to-talk button - but don't operate the set unless You are holder of an amateur radio license for the corresponding (12 m) frequency band.